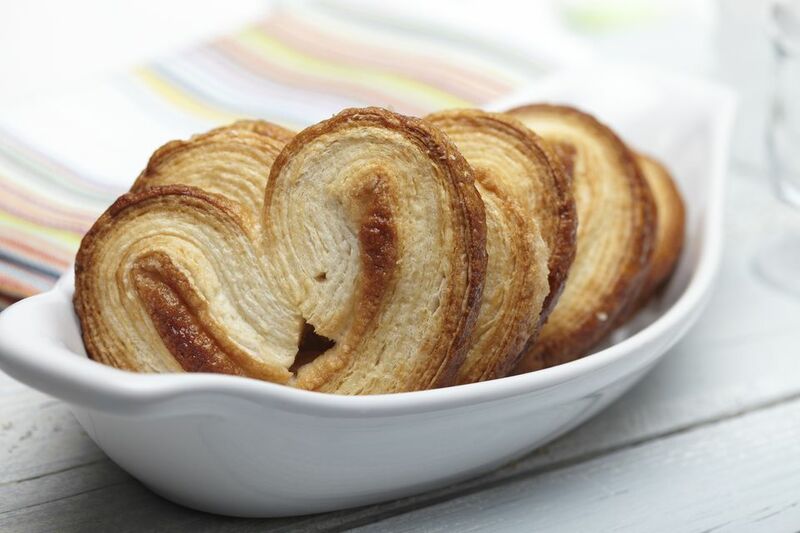 These beautiful little puff pastry heart sweet rolls can be served either as cookies for an afternoon pick-me-up or as a sweet cinnamon-dusted roll for brunch. They're pretty enough for a special occasion but simple enough for an easy weekend treat. Lightly grease cookie sheets or line with parchment paper. Combine sugar and cinnamon in small bowl. Sprinkle work surface with half of the cinnamon sugar. Place dough on cinnamon sugar. Lightly press dough into sugar and roll out slightly with rolling pin. Brush dough with 2 Tbsp. butter and sprinkle with rest of sugar. Starting with the shortest sides, roll up each side jelly-roll fashion until the rolls meet in the center. Refrigerate dough 30-40 minutes or until dough is firm. Preheat oven to 375 degrees. With a serrated knife, gently cut the roll into 16 slices. Place slices cut side down, 2" apart on prepared cookie sheets; press down to 1/4" thickness. Pinch bottom edge of each slice to form a heart shape. Drizzle hearts with remaining 1 Tbsp. butter and sprinkle with any remaining cinnamon sugar. Bake at 375 degrees for 8-13 minutes or until golden brown. Remove to wire rack to cool completely; store at room temperature.